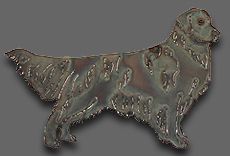 Steel dogs are created to be used indoors or out. They are made of raw steel and are guaranteed to rust unless sealed. or U-bolt or it can sit on a hard surface; your fire place, patio, entry hall, mantle, etc. Do you want a custom piece of your pet? Send or email me a photograph and I can create your pet in steel.